When I started at Hallmark Cards in 1992, my first position was in licensed properties. I was the editor for Peanuts and Garfield cards, and later Cathy and Ziggy and Disney and “Saturday Night Live” and pretty much any other licensed character that could sell a humor card. I even traveled to Disney in California at one point and attended ‘Pooh College’ — as in Winnie the Pooh — and became somewhat of a corporate expert on how Winnie should look and sound to greeting card audiences, whether they be children, young adults, teens or even adult Pooh fans. 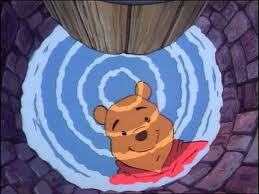 Winnie the Pooh is also the World Ambassador of Friendship. The United Nations made an official declaration in 1997. It’s a piece of trivia that you might find handy, because it’s National Friendship Day. Yep — Congress made that official as well, way back in 1935. So, here’s my official note of gratitude to my friends — the ones I see every day, the ones I miss every day and the 340 I ‘talk’ to every day on Facebook. I’m sure Pooh would approve.